The opening scene in Aaron Schneider’s marvelous, nuanced Get Low (at Angelika Dallas and Cinemark West Plano) introduces a mystery that isn’t solved until the final reel: a house, barely visible in the darkening gloom, begins to burn, and a man escapes from the second floor and runs away. The film is about much more than that single, haunting image and, truth be told, isn’t really a mystery. We know that it’s somehow connected to ornery outcast Felix Bush (Robert Duvall, in one of the finest performances of his brilliant career). It’s not even particularly surprising to discover that Felix has many layers that must be unraveled. What is refreshing about Get Low, however, is the quiet dignity with which it proceeds. There’s something about the way that Schneider and his collaborators place and move the camera, and the relaxed pace at which it unfolds, that is very welcoming. It feels like you’re in the hands of people who know what they’re doing, and that the time you spend in their company will be well-rewarded. Duvall modulates his performance with delicate precision. It’s not until the story concludes that the grace of his ‘character arc’ makes sense. I hesitate to use that term because it’s been devalued from overuse and misapplication. Felix doesn’t change his personality during the course of the film’s running time. He’s the same person, but the story moves around him, like a magnifying glass revolving around a rough-cut diamond, and each glance reveals a different facet of the man. At the outset, it’s enough to know that Felix exiled himself to a solitary existence after a grievous mistake. We don’t know the particulars. We know that Felix has become a legendary cuss, said to have committed murder and other heinous acts over decades of isolation and occasional visits to the nearest town for groceries. It is the 1930s in a small town somewhere in rural America, and that’s just the way things are. 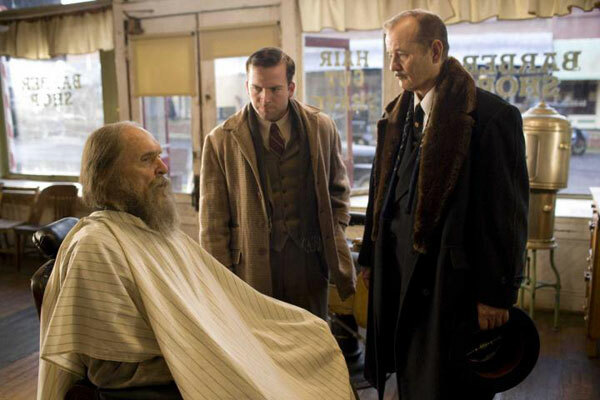 Something prompts Felix to begin planning his own funeral, and that leads funeral home owner Frank Quinn (Bill Murray, in a truly deft comic performance with depth) and his assistant Buddy (Lucas Black) to the inhospitable doorstep of Felix’s cabin. Felix seems to take a liking to the young man, and Frank restrains his charm, and the three men start the arrangements for what Felix desires: to be present at his own funeral, so he can hear all the stories that people have been telling about him. Those stories, reportedly, have gotten some people shot, so Frank has quite a publicity job ahead of him. But he’s eager for the sure to be well-paid work and more than up to the task. In his first scene he laments the lack of local business and notes that “in Chicago, people know how to die.” Whenever new challenges are presented by Felix’s demands, or objections are raised by Buddy, Frank sighs and clicks on his brain to start solving the problem. Felix’s stone-cold facade begins to melt in earnest when he crosses paths with Mattie Darrow (Sissy Spacek), whom he hasn’t seen in many decades. She sets in motion another cycle of questions that are slowly answered, this time about old flames that never die. Beyond the simple pleasure of watching three seasoned actors engage in unexpected ways with one another (young Mr. Black is fine but not up the level of Duvall, Murray, and Spacek), the story and situations are richly humorous. Some of the pay-offs are easy to see from a long way off, but the destination is not the point in Get Low. The journey is the thing, and it’s definitely a worthwhile trip.